Looking for a 2019 summer adventure? Considering a career as a park ranger or interpretive guide? Want to explore to determine whether this is the career for you? Have you taken a Certified Interpretive Guide course with the National Association for Interpretation, and/or need experience? Then look no further! Nebraska National Forest and Grasslands is, once again, offering an amazing volunteer opportunity at Hudson-Meng Education and Research Center (HMERC)! HMERC is in a picturesque, rural setting on the Oglala National Grasslands in Crawford, just south of the Black Hills of South Dakota. 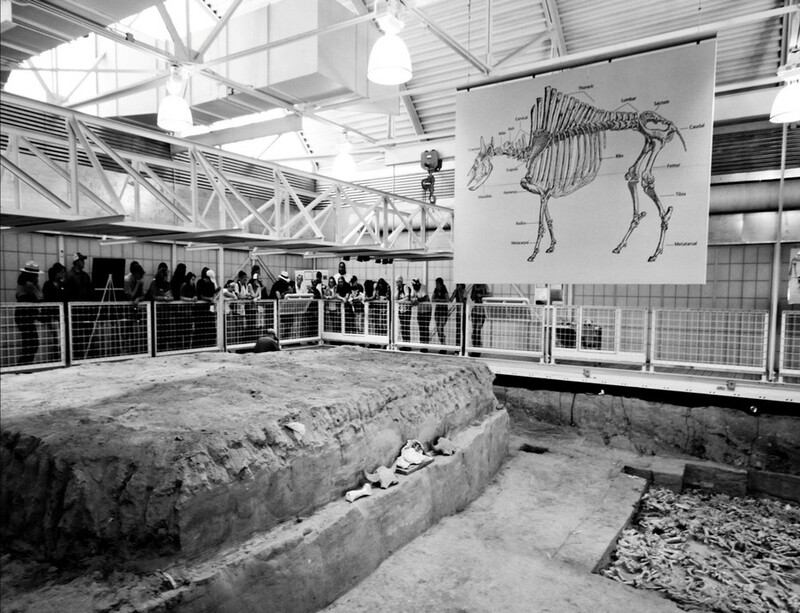 HMERC houses one of the most important discoveries of Archaeology and Paleontology in North America: the Hudson-Meng Bison Kill Site. From approximately Memorial Day to Labor Day each year, HMERC is open to the public five days a week (Wednesday to Sunday) and, for the past several years, dedicated PIT volunteers have helped the project via hosting, site interpretation, personal projects, education outreach, and more. We extend the invitation to you again this summer! Hudson-Meng Volunteer Interpretation positions provide PIT volunteers with hand-on training and resources to develop or strengthen interpretation skills by interacting with visitors at the Heritage Visitor Center. Volunteers will assist Forest Service rangers with staffing the visitor center, and share information about history, preservation, and Grasslands natural resources with the visiting public. Day-to-day duties will vary to allow volunteers a wide range of experiences, such as assisting Forest Service personnel in designing and providing interpretive programs for the public that include archaeology, history, paleoecology, and paleontology. You may also be called on to assist with the development of educational materials about Hudson-Meng and Toadstool Geologic Park, or participate with outreach events to help promote Hudson-Meng. Additionally, volunteers are expected to assist staff with routine maintenance and cleaning of the facility. Each volunteer will be expected to contribute a minimum of 24 hours per week to the project. An additional task that is very important and required but, more importantly, an opportunity for growth and career advancement and education, is that all PIT volunteers are expected to develop and provide an interpretive tour in order to provide public awareness of the site’s or region’s cultural resources. The tour must relate to Hudson-Meng, but should fit within your own educational field or topic of interest. Hudson-Meng staff and supervisors will serve as mentors to volunteers by providing guidance and resources as the tours and outreach programs are developed. Finally, the project leader is willing to sponsor undergraduate or graduate students who wish to earn college credit by completing an independent study or internship program through their respective academic institutions. If interested in receiving academic credit for the summer project, please indicate this on your application, and discuss details with the project leader if you are selected. This is a unique opportunity, and makes the Hudson-Meng Interpretation PIT project an especially attractive fit for interested college students considering careers in archaeology/paleontology or as park rangers or park guides! Applications will only be accepted until each session is filled, so apply today! Facilities: PIT volunteers are allowed to camp, at no charge, at dedicated research campground right next to the visitor center facility; there are modern bathrooms and showers (private each for men and women); weather port kitchen with two gas stoves, refrigerator, freezer, and potable water (water has been known to go down, but not often); several electrical outlets are scattered throughout the campground and can be used, if needed. Camping areas are undeveloped and volunteers are responsible for their own camping equipment. Low profile, heavy duty tents, and related outdoor gear are a MUST due to possible extreme thunderstorms, hailstorms, and high winds. RVs allowed in campgrounds if within size limits (determined case-by-case); no water or sewer hookups; volunteers responsible for meals and transportation. Please note, the road from Highway 271 to the Hudson-Meng site is unpaved and can become muddy after heavy rain.